Battle of the block was absolutely horrible. It had a negative effect on the 2 seasons (BB16, BB17) it infected. For some strange reason during Season 17 CBS called it a fan favorite. C’mon, did any fans like it? A recent interview with executive producer Rich Meechen confirms there will be no Battle of the Block this season. Boooo it was a fan favorite. Sarcasm aside this is great news, coupled with what appears to be a strong cast it’s looking good. However… Allison Grodger says there’s a new competition coming into play on Sundays. New competitions probably means a game mechanic change. This is terrifying, maybe we’ll be missing The Battle of the block after all. Hollywood Reporter got some answers after joining executive producers, Allison Grodner and Rich Meehan, for a private house tour. And they didn’t hold back. Will “Battle of the Block” be returning? “No battle of the block!” quips Meehan. Adds Grodner, “A new Sunday competition is coming into play. . . In case you forget how the BOTB works. There was two Heads of Households. Each one nominated 2 houseguests for a total of 4 players nominated. The 2 pairs then compete in a competition called “Battle of the Block”. The pair that wins are removed from the block and are safe from nomination for the remainder of the week. Even if the POV is played they cannot be nominated. The HOH that nominated them is “Dethroned” and is now eligible for nomination if the Power of Veto is played. Sounds great but it’s not :( resulted in the HOH’s always working together giving us nice predictable weeks..
but what could the new comp be? The worst part about this show is that they recycle the same old boring things. Thank god BoB is not back. Such a dumb idea. The only thing to “expect” is that production will try to rig the game for its favorite players. I’m ready . Let’s hope for an fun and exciting season. We need more super power of vetoes or last moment save powers. I did like the 3 people couldn’t vote power they had last year. A great twist would be if Production does not get involved trying to fix the game for their favorite this season. as long as it isnt Frankie or Frank!! Pleeeeeeeeeeeeeease do NOT bring back Frankie!!!! Anyone but him!!!! It’s noxious to watch him. He’s obnoxious, grandiose and revolting piece of garbage. And that there is an insult to garbage…. Excited about this upcoming season. 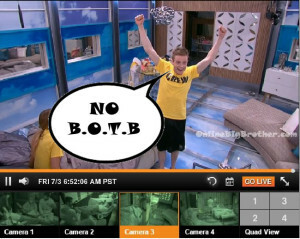 Even more excited about the battle of the block not returning. Hoping the coaches are true fan favorites, not production favorites. I wonder if that Sunday comp is a coaches competition? Hopefully it isn’t. bring back Frankie the putz Grande . I am looking for archive footage of BB16 – It was (I think) July 1 or 2 after midnight. Victoria comes out to watch the guys Cody, Zach, Hayden play pool. She says she can’t sleep because it’s too hot and she normally sleeps naked, walks away. Cody says she’s ugly, etc. Zach says she’s stupid, etc. She comes back and asks who is the hottest girl in the house and gets mad when they won’t answer. ANYONE have this or remember it? Hmm. That rings a bell…. Actually more like June 29. Any help with footage is much appreciated and the place you post it. Thank you. It forced the nomination of more housemates. Quite often there’s only one or two obvious people who present themselves as targets. That makes an alliance’s work far easier. But when you are part of a dominating alliance and you end up controlling both HoH’s, that’s four people who are mad and out for blood. And when the housemates start to reduce the issue of who to nominate becomes argument forming and lots of thinking and strategy is required especially when your own alliance members are forced to volunteer themselves etc. I also liked the short period – normally only a day or so – when both HOH’s were frantically trying to decide who to put on the block. The whole additional room upstairs where gametalk goes into overdrive. BOTB suited the era of big dominating alliance because it caused all of this mayhem. Remember the era started with BB15 when Amanda controlled the house with a huge alliance backing her up. It resulted in virtually no gameplay. Everyone placed themselves nicely on the huge totem poll (Amanda, McCrae, Judd, Andy, Elissa, Helen, Jessie and Candice) and all we got was ‘it’s too early to make a move’. If these big alliance continue which is a strong possibility then we might just see another BB15. So BOTB did not cause the big dominating alliances. The safety in numbers mindset started on BB15. That season would have been fundamentally improved if BOTB had been in play. We would have seen people like Helen jump ship at least two weeks earlier. Elissa and Helen would for sure have been considered for two of the four nominees. Amanda would have said something like ‘it’s OK, we just need your help this week’, but they would have been fuming and alarm bells would have started ringing in their heads knowing that their boot time was coming.